On the morning of November 4, 2014, the board members of Global Tibetan Professional Network of North America were given an opportunity for a special audience with His Holiness the Dalai Lama at Hotel Beacon, New York. With an enormous feeling of joy and excitement, I took a Subway train to the hotel. As I stepped out from the Subway station and started walking towards Hotel Beacon, I saw a large group of people covering the entire sidewalk of the block. Initially, I had no interest in this group as it is very common to see people greet His Holiness the Dalai Lama wherever he goes. However, as I came closer to the group, I saw a number of White people in Buddhist robes. Walking further towards the hotel, I saw drums and banners that says "Stop Lying Dalai Lama." Immediately, I realized that this group (Dorje Shugden practitioners) is protesting against the visit of the Dalai Lama. Being a Tibetan and facing the protest for the first time made me really uncomfortable. I never saw people protest against the Nobel Peace Laureate His Holiness the Dalai Lama in my entire life. He is always respected for his principle of non-violence, love and compassion. For Tibetan, he is a father who single handedly nurtured the Tibetan communities in exile and continues to be revered as a beacon of hope for the reunification of Tibetan people. On the next sidewalk of the street, there were Tibetans holding banner that reads "Long Live His Holiness The Dalai Lama." 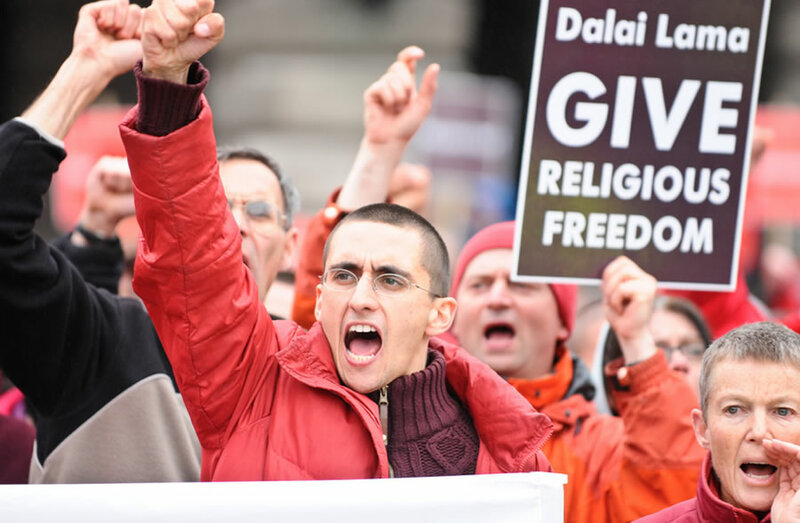 It was an ugly confrontation on the streets of New York between two groups: one who supports the Dalai Lama and one who accuses him of lying and denying religious freedom. As a Tibetan who revere the Dalai Lama as an embodiment of Avalokiteshwara, I felt angry and humiliated by these Shugden practitioners. After taking in all the emotional turbulences, I waited in the Hotel lobby with other board members for the audience. At around 8:45 AM, we were ushered by a security guard towards the backside of the Beacon Theatre entrance (I believe). As we waited, we were all excited but very unsure about how the audience will go. Will he ask questions? How many minutes will he spend with the group? Will there be a group photo? Are we good enough with our Tibetan language skills? How and who will introduce us? and many more. In about half an hour, we saw His Holiness the Dalai Lama walking towards the group. Holding a white scarf and black rosary, I was ready to greet. After a quick introduction of the group, he gave us around 5 minutes of spontaneous teachings. Among the teachings, he stressed on the importance of learning "Science of Mind" and "Emotional Therapy." He further emphasized the need of lifelong learning by providing himself as an example. Though he is 79 years old, he said he is learning everyday from the Nalanda teachings. There is no better example of a lifelong learner than the Dalai Lama. As I walked out from the hotel, I was left speechless and lost. This was the moment I will never forget to cherish. For the next few minutes, I kept trying to transfer this 5 minute teachings onto my long-term memory. However, as I step out from the hotel and started walking towards the Subway station, I again saw Shugden practitioners beating drums and rhyming Stop Lying Dalai Lama. Initially, I thought I will just cross the street and avoid the displeasure of walking in front of these protestors. Then, I thought about the advice I received a few minutes earlier from His Holiness the Dalai Lama about science of mind and emotional therapy. 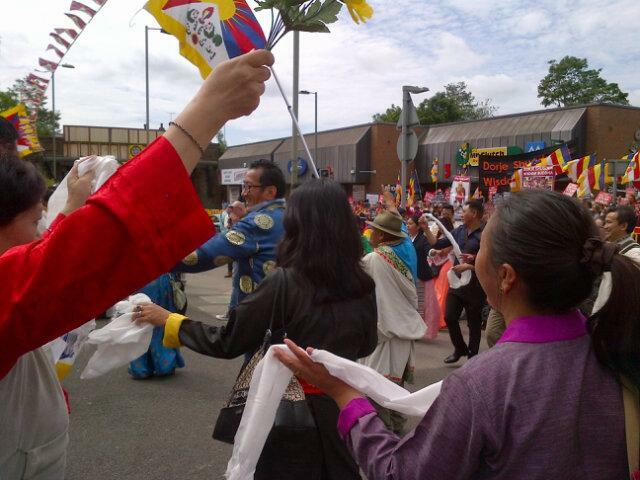 Immediately, I decided to walk in front of these large group of Shugden practitioners. While walking, I looked at them with no feeling of anger and dislike. I was no more uncomfortable. Rather, I was inclined to talk to them but I resisted as my knowledge on Shugden is limited. Nonetheless, I felt the power of His Holiness the Dalai Lama. His advice on the Emotional Therapy was what we all need to practice including followers of Shugden deity. If we all work on healing our emotion (including anger and hatred), there will be no ugly confrontation on the public streets. Note: If you are interested in knowing more about Shugden controversy, please click HERE to read an excellent piece from Prof. Robert Thurman. Wow, very moving post. 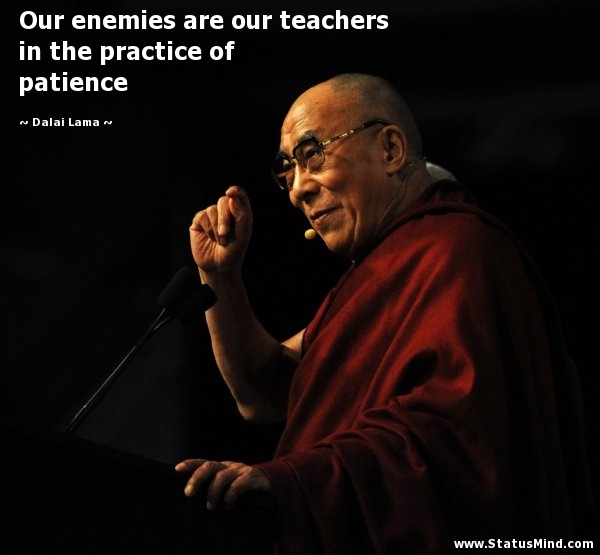 I am impressed that you were able to incorporate the Dalai Lama's teachings so quickly. I don't understand these Shugden pratitioners and their "fundamentalism" and I don't think I could have let my anger go in that situation. Congrats. Never could I ever as a Buddhist convert do this kind of political action. I do not resonate with several dharma organization here in the states, but to attack our master of Dharma is beyond belief. These are not real buddhist but fakes paid by the Chinese communist to attack His Holiness. What can be done for the ailing Tibet with all these lies and deceptions that are being fabricated. The Chinese government will do anything to destroyed His Holiness, and now Obama has turned against Tibet as well. Meanwhile the American dharma centers are out of control, with all kinds of elitism and false dharma teachers in control. America is filled with programmed ignorant beings who do not vcare about but money and pushing their own agenda down the throats of the /government. Thank you so much Thepo Tulku who is a real tulku which I feel I can acknowledge my friend. Well written... Your impression about his holiness's teaching was indeed moving, touching and influential... Thanks. Keep good things always. Tashi Deleck!